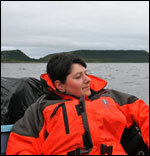 Amanda is the co-ordinator for the Labrador Metis CURA project. When not working on the CURA project, she spends her time surrounded by stacks of books and papers, as she is finishes her Ph.D. in Archaeology at Memorial University. Her research interests lie in historical archaeology generally and the archaeology of the French presence in Newfoundland specifically. She is also an occasional undergraduate course instructor in the Department of Archaeology. When not sitting in front of a computer, she enjoys reading, cooking, and going for long walks to make up for all of the cooking. I graduated from Memorial with an MA in archaeology in 2010. While my master's research is not related to the CURA project I have been involved with this project since the begenning. In the summer of 2009 I particiapted in the partial excavation of a number of sod houses in southern Labrador, directed by Dr. Marianne Stopp. 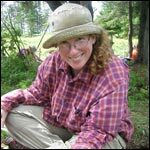 Since then I have aided Dr. Lisa Rankin in the excavation and mapping of Inuit sod houses at Indian Harbour during the 2010 and 2011 field seasons. Following the field seasons I have catalogued artifacts, prepared artifacts for conservation and prepared the faunal assemblages for shipment. I have also been engaged in most other areas of the project including the digitizing family trees for Mrs. Patty Way, transcribing interviews for Dr. Mario Blazer, copying archival documents for Dr. Hans Rollmann, and transcribing all the Governing Board and General Meeting notes. I graduated with a MA in History in 1996, specializing in the history of colonial New England seafarers. 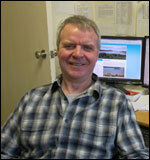 In early 1997 I became the senior project coordinator for the Newfoundland and Labrador Heritage Web Site at Memorial University. In 2000, the NL Heritage Web Site was placed under the care of the Maritime History Archive at MUN, and in addition to my NLHWS role, I became the assistant archivist and digital projects coordinator for the MHA. At Lisa's request, I designed, created and managed the web site for the 2007 CAA/ACA conference held in St. John's, NL. In 2009 I designed and created the CURA web site, and since its creation I have been its webmaster. Unlike Amanda, above, who when not in front of a computer, likes to eat and then take long walks, I just like to eat.